After my recent stern lecture to winter, the snow on the first day of spring naturally led me to an extended metaphor. Why is Winter bullying into young Spring’s territory? Or, should I blame Spring? I mean, freakin’ assert yourself, don’t be a doormat! Winter’s not the boss of you! But luckily for you, gentle readers, I’m going to follow the advice from Siblings Without Rivalry and stay the heck out of it. Back on Friday, when the weather was beautiful, we spent hours on the playground before rushing home for a quick dinner and then to our elementary school’s Learning Fair. It was particularly exciting this year, because even though we go every year, this was the first time M actually presented something. 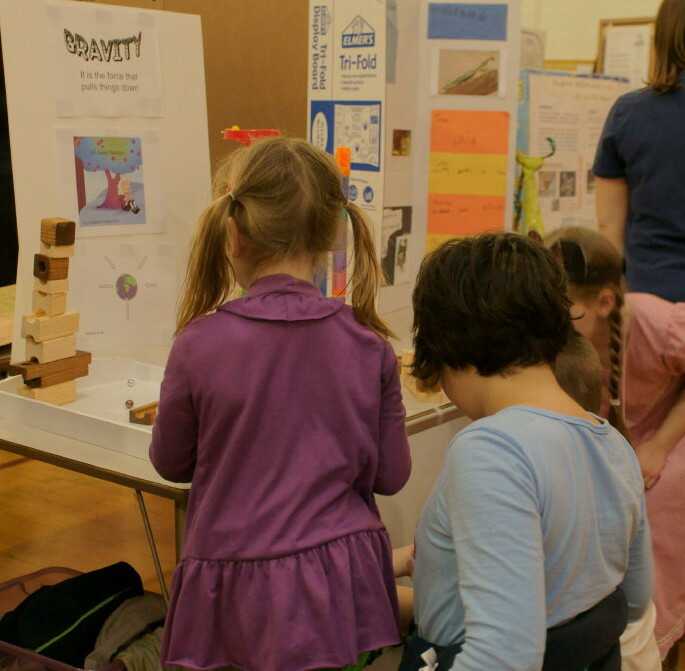 It’s sort of a science fair alternative, because anyone in any grade can research anything: science, history, whatever. Which means that tons of kids participate, and topics range from the littlest kids setting up vast Playmobile scenes to kids bringing in pets or playing the drums or presenting an exhibit entirely devoted to a brand of candy. One little boy was buttonholing adults, using his papier mache model to explain how an insect sees, and another launched into a several-minute schpiel on Greek architecture while his mother gestured apologetically from behind him. No problem at all! They were adorable. They were about to burst with all of that knowledge that they had to share. The Learning Fair is huge. J didn’t do a presentation, but she had a fabulous time going from exhibit to exhibit and hobnobbing with the big kids. J and others experiment with gravity. M decided to study Japanese-American internment during WWII. I know: heavy, right? She chose it after reading Weedflower. She gathered up quite a bit of information and great photographs and went the “substance over style” route. But a big part of the fair is presenting the information to the people who mill around. She wasn’t crazy about that part. There were too many friends to visit and interesting things to see, so even when she wasn’t on her break, she’d wander away to chitchat with friends. Between touring around myself, I’d shoo her back to her table and even send extra adults her way to quiz her. Because I’m mean like that. Sorry for the weird trim--wanted to cut name and face as usual. M did great, and she was rightfully proud. J’s already decided that she wants to study dolphins next year. So it was a wild success. But after the marathon playground-playing and the tremendously overstimulating learning fair, we barely stumbled home. Next year, I hope it rains that afternoon so we can pace ourselves a little better. A lovely story. M must be so proud!